Trivia at 33 Taps was so much fun! Globochem and The Bean Counters took early leads, but a successful double or nothing in round 6 put DAD Jokes (pictured) in the lead just in time to win the night! as thirsty patrons lined up at the well. But King Trivia would put their brains to the test!! It was a good day for Holiday cheer, and a great day for trivia. 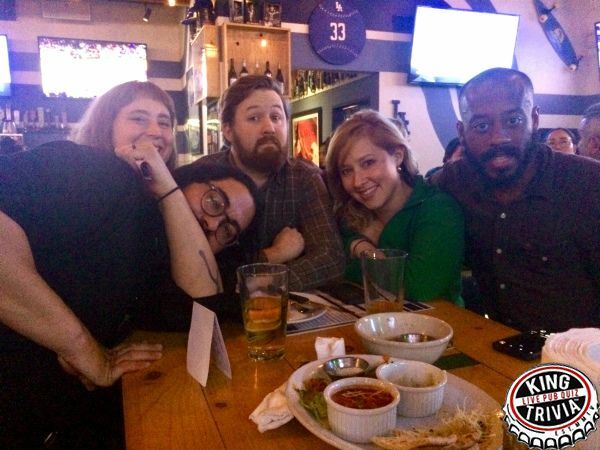 The hardy players at 33 Taps in Silverlake gathered round with hopes that Christmas would come early in the form of free beer. A great selection of holiday questions ranged from Christmas movie titles to Charlie Brown Christmas characters. Of course, there were some stellar questions about the big bearded fellow that everyone loves on Christmas. I'm of course talking about Jesus Christ. The valiant Bean Counters doubled down double times and it worked in their favor. They took the win with 75 points. However, the good little elves of Santa Land brought some gifts for our losers as well, including a mistletoe mug, and a certified One Direction Tour DVD. There was laughter. There was joy. There was Harry Styles. Really, isn't that what Christmas is all about?